The best effects of pickup is away from the microphone head 30cm. Microphone head should not be toward speakers, in order to advoid howling. 1x Stereo 0.25in (6.35mm) jack to mini 0.14in (3.5mm) jack adaptor. Its tight pickup area focuses directly in front of the microphone and reduces other surrounding sounds, ensuring that your subject is isolated from distracting background noise. 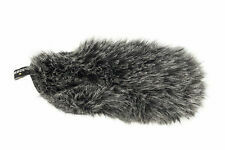 High quality directional microphone. UK available stock in 2 working days - BOYA BY-WM6 Lavalier Clip Wireless Microphone System Mic UHF for Phone, Camera, Pitch side rebroadcast systems, operates on 606-614.00 mhz UHF UK. Condition is New. 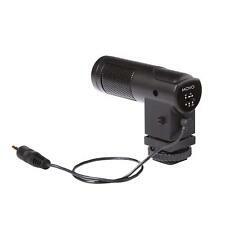 3.5mm to 3 pin XLR adapter now included. Dispatched with Royal Mail 2nd Class. International post available for all countries. BOYA BY-M1 is an Omni directional lavalier microphone, designed for Smartphones, DSLR, Camcorders, Audio recorders PC etc. 1x Boya Microphone. Super sound for presentations and video audio recorders. This mic is in new condition. Used just a couple of times. No box, but will be well packed for shipping. Rode VideoMicro Compact On-Camera Microphone with Rycote Lyre Shock Mount. Condition is Used. Dispatched with Royal Mail 1st Class. 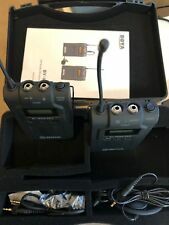 Description: The condenser microphones. SGC-598 is specially designed for camera, interviews and other applicatoins. It's a good choice because it can match with any brands of camera and simply fixed on the camera. Please read this manual detailedly before using to make sure the correct operation and exert the optimun function. Features: . Rode Video Mic Pro. Why buy new at over £170 buy this one as its like new in reality. The only thing I couldn't find is the instructions but you can download them at the RODE website where you'll also see the full specifications of this microphone. 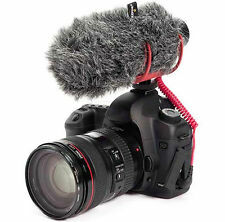 RØDE Microphones VideoMic Pro R Compact Directional on Camera microphone. There is slight deformation to the foam that covers the microphone due it it being in my camera bag with lenses, but this usually springs back after a few days. In near perfect condition together with a Rode deadcat windscreen and a Hermit Shell carrying case. The VideoMicro is a compact microphone designed to improve the audio quality of your videos. Featuring a suspension structure composed of a hard-wearing thermoplastic, it is far more effective at minimizing unwanted vibrations, handling and cable-borne noise than traditional elastic suspensions. Good quality microphone - plugs into your headphone jack. VideoMic Pro Specifications. High Frequency Boost will boost high frequencies enhancing detail and clarity in the recording. Automatic Power Function with plug-in power. Power via LB-1, 2 x AA Batteries, Micro USB. For DSLR - doesn't require battery power, just plug and play. One of the best quality you can buy. Full instructions included. RØDE Microphones VideoMic Directional on Camera Microphone. Condition is Used. Dispatched with Royal Mail 2nd Class. I was given this as a gift and I don’t have any use for it unfortunately I can’t return it. I hope it can find a creative home for a filmmaker. RØDE VideoMic Pro-R On-Camera Microphone. (Sealed / Unopened). Condition is New. Dispatched with Royal Mail 1st Class. 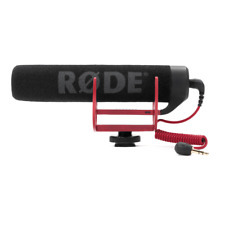 RØDE Stereo VideoMic Pro Microphone. Condition is Used. But in very good condition. Dispatched with Royal Mail 2nd Class. Good condition, works perfectly. incredible sounding microphone. TheRode VideoMicro is a compact microphone designed to improve the audio quality of your videos. The microphone body is made from aluminum, giving it a high level of RF rejection, and is finished in RØDE’s high-grade ceramic anti-glare black coating. Constructed from a single piece of hard-wearing thermoplastic, the Lyre® provides superior acoustic suspension to traditional elastic solutions, and will never wear out, sag or snap. Rycote® Lyre® shock mounting onboard. The VideoMicro is a compact microphone designed to improve the audio quality of your videos. Optionally available is the RODE SC7, a TRS to TRRS cable that allows the VideoMicro to be used with smartphones, to capture crystal clear, directional sound for video and video applications such as Periscope. Details from Rode Integrated Rycote® Lyre® shock mounting. Its tight pickup area focuses directly in front of the microphone and reduces other surrounding sounds, ensuring that your subject is isolated from distracting background noise. Bought in August to use for a wedding but was never used. Brand new, never been used. Comes without box. Due to these features, the BY-VM190 is most suited for outdoor use such as on location. Boya BY-VM190 Shotgun Microphone Specifications. Transducer: Condenser Microphone (Unidirectional). Polar Pattern: Super-Cardioid. Its standard sized shoe mount also includes a 3/8" thread in the base for easy mounting on a boom pole or stand. In addition to the microphone's native 40Hz-20kHz response a selectable high-pass filter at 80Hz is available, which will prevent low end noise such as air conditioners and traffic from being recorded. BOYA BY-M1 is an omni directional lavalier microphone, perfect for video use, designed for Smartphones, DSLR, Camcorders ,Audio recorders, PC etc. 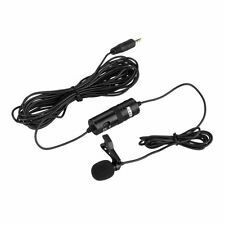 The lavalier microphone features an Omni pickup pattern, for full, 360-degree coverage. The Rode VideoMicro is a compact microphone designed to improve the audio quality of your videos. The microphone body is made from aluminium, giving it a high level of RF rejection, and is finished in Rode's high-grade ceramic anti-glare black coating. The Movo VXR1000 is a complete solution for recording audio directly to your DSLR or camcorder. The microphone itself has a hypercardioid polar pattern that allows it to clearly pick up subjects directly in front of it while strongly rejecting unwanted off-axis sound. Boya Mic for sale. Used condition – See below. BOYA BY-M1 is an Omni directional lavalier microphone, designed for smartphones, DSLR, Camcorders, Audio recorders PC etc. 1 x 1 BOYA BY-M1 3.5 mm. Microphone only. Tablet PC & Accessories. Stereo Audio Recording. Polar Pattern: Stereo. 1 Mic Body. 1 Mic Windscreen. Very appreciated for your support. Maximum SPL:larger than 120 dB. We will do our best to solve your problem as soon as possible. RODE Videomic Go, ideal mic for vlogging with a DSLR or making any other type of videos for YouTube etc. Used only a small amount, in perfect condition. RRP on these is around £70 but I think they're around £50 on Amazon, so pricing compared to that. Feature: *BOYA BY-DMR7 is a broadcast quality condenser microphone specially designed for DSLR cameras and camcorders. *The integrated flash recording allows you to record 24-bit/48kHz wav audio files to MicroSDHC cards(not included), supporting capacities up to 32GB. *It features one-button recording and easy-to-read menu display, making your recording work much easier. *The 3.5mm data cable connects the BY-DMR7 Recorder to your camera's audio input, while the stereo headphone output allows you to monitor incoming audio.